Classique Furniture has been the best in their trade for decades. The quality of work is defined by the high standard of craftsmanship and attention to detail, ensuring the piece of furniture can be enjoyed for years to come. Each piece is hand made and hand finished, to the finest detail. Classique Furniture pieces are known for embodying a sense of elegance while including subtle features that take the design component to the next level. With true design, it is these small details that make the difference and Classique Furniture is a testament to this. The energy of those who succeed in realizing their ideas, is naturally emanating from Albino Celato who in 2003 founded De Castelli, a brand destined immediately to be asserted, thanks to a centuries-old experience inherited from his family of blacksmiths well rooted in the territory of the Treviso foothills and masters in the processing of iron. Iron, as we know together with wood and stone, is one of the three natural and precious materials that from the beginning offer themselves to human ingenuity in the creation of useful tools and artefacts. De Castelli soon identified himself as a company that introduced the design, declining it with iron in the home and in the dehors, managing to combine his beloved artisan tradition with the most advanced technologies. An encounter that sets the senses free and traces the colour of every day. The pieces thatHenge create are unique masterpieces that cherish within their souls a destination and all the emotions lived during the travel towards their realization. Material feelings to experiment through a daily contact, discovering a design able to speak not only for itself, but also for the ones who choose it. Choosing a piece of furniture is reductive. Because a piece of furniture is a whatever piece, it tastes like serial production, like something static that never truly belongs to you. 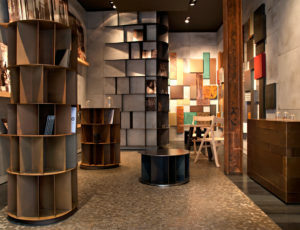 The philosophy that has led Henge since its dawn lays in the negation of these serial and industrial principles, enslaving our lives: at Henge, they create a design that embraces the total uniqueness, the idea of connecting each client and each experience not with a piece of furniture, yet with a traveling companion. Since its foundation in 1956, JAB Anstoetz has developed a name as a quality leader in the field of upholstered furniture. 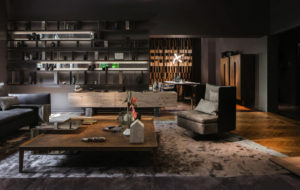 From the outset, the company has been part of the internationally active JAB Anstoetz Group and so is firmly established in a group of companies which has acquired proven expertise in the world of interiors and furnishing. Although now international in scope, as far as production is concerned, the company is committed to their quality of origin located in Germany. For customers around the world, the name JAB ANSTOETZ stands for visionary design and top quality textile creations that set new trends time and again. Not only does their range of precisely coordinated furnishing textiles encompass a vast palette of exquisite decorative and upholstery fabrics, but also roller blinds, plissé blinds and panels for convenient sun shading. As a stylish counterpart to the fabric portfolio, they offer fitted carpets as well as designer flooring and rugs in the highest quality grades. The coherent range is completed by carefully handcrafted upholstery furniture and a small but refined collection of curtain rods and wallpapers. James Salmond is an Australia-based furniture designer who produces distinctive, high quality bespoke furniture. James can customise most designs to suit your individual requirements with the option to customise by size, veneer and fabric. James Salmond Furniture provides customised and unique furniture to fit your personalised style and home. James Salmond has worked in the furniture and cabinet making industry as a highly respected cabinet maker for 27 years. As an avid collector of raw materials, James Salmond Furniture holds many rare timbers and veneers that are highly sought after. This also allows our clients to feel and look at the raw materials and examples that goes into their custom made designer furniture. 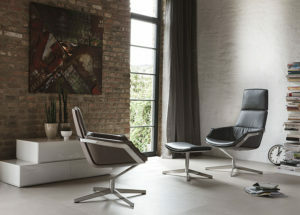 Roda was founded in 1990 as a company specializing in the production of top quality outdoor furniture. The company’s success was assured thanks to its founder, Roberto Pompa. In 2005 the decision was made to consult to one of the maximum interpreters of the Italian design in the world, Rodolfo Dordoni. 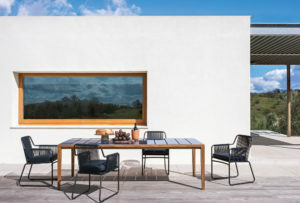 Roda began to make a name for itself as a trendsetter, interpreting the outdoors, with its connotations of relaxation, emotion, elegance and informality, as contiguous with the indoors and vice versa. Since 1926 Tonon is a well-known international brand in the world of seating, reliable and synonymous with design and quality MADE IN ITALY. Characterizing features that come from the past: their origins date back to the twenties, include years of careful and creative manufacturing. Even after the industrialization of the fifties, the pleasure of thinking and making never ended. Vanessa Mitrani is a unique figure in the field of creative glass blowing. 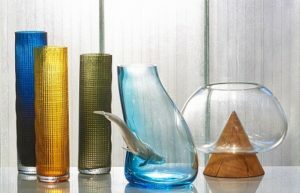 Expertly handling glass in its various forms, she claims her designer status by systematically creating collections comprising entirely of unique pieces as a result of a process that remains random. Vanessa Mitrani has developed a prolific career since 1998, as a respected designer and an expert in her medium. She has experimented with multiple substances to pair with glass, and essentially settled on metal. She has continued to move forward with her designs by deciding to manage all aspects of the development of her pieces. While many designers stick to the design only, Mitrani has taken over the design, production, and distribution of her work. Every year Vanessa Mitrani presents her new collections at the Maison & Objet show in Paris, proving how glass remains a living, inventive and inspiring material.